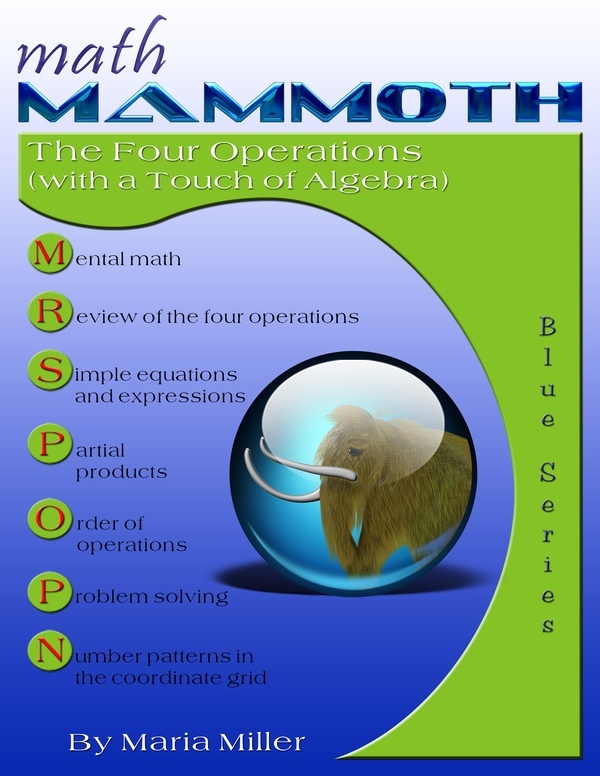 Math Mammoth The Four Operations (with a Touch of Algebra) - a printable worktext for fifth or sixth grade. 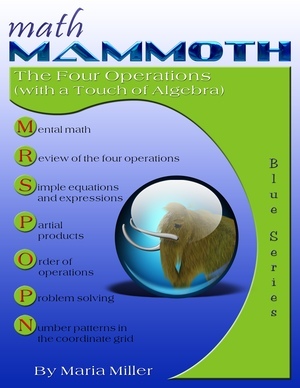 Math Mammoth The Four Operations (with a Touch of Algebra) is a mathematics worktext meant primarily for fifth and sixth grades. Some of the lessons can also be used in seventh grade. A worktext means that the book is a textbook and workbook together: the lessons include both the explanations of the concepts, as well as practice exercises. The main topics studied in this book are simple equations, expressions that involve a variable, the order of operations, long multiplication, long division, and graphing simple linear functions. Students encounter the exact definition of an equation and an expression. They practice the order of operations with problems that also reinforce the idea of the equal sign (“=”) as denoting equality of the right and left sides of an equation. This kind of exercises is needed because children may think that an equal sign signifies the act of finding the answer to a problem (as in 134 + 23 = ?, for example), which is not so. Students solve addition and subtraction equations both with the help of diagrams (a.k.a. bar models) and also without. These diagrams (the same kind as in Singapore Math) are also used for simple multiplication and division equations and for mixture equations, such as 4x + 38 = 128. We also present lessons on multi-digit multiplication (multiplying in columns). These lessons go farther than just reviewing the well-known algorithm. We study in detail: multiplying in parts (partial products), how those partial products can be seen in the algorithm itself, and how multi-digit multiplication can be visualized geometrically. Students also practice long division, including two-digit divisors, as a review from fourth grade. Although the book is named, “The Four Operations,” please notice that the idea is not to practice each of the four operations separately, but rather to see how they are used together in solving problems and in simple equations. We are trying to develop student's algebraic thinking, including the abilities to: translate problems into mathematical operations, comprehend the many operations needed to yield an answer to a problem, “undo” operations, and so on. Many of the ideas in this chapter are preparing them in advance for algebra. This book is suitable for 5th and 6th grades. It includes both the teaching material (lessons) as well as the exercises in the same book. The answer key is appended. Math Mammoth Fractions & Decimals 3—a worktext for all fraction and decimal topics with large denominators and more decimal digits (grades 6-7). Math Mammoth Ratios, Proportions & Problem Solving—a worktext about ratios, several ways to solve proportions, and problem solving with the help of the bar (block) diagrams (grades 6-7). Make It Real Learning: Arithmetic I—an activity workbook with real-world data, focusing on situations that use addition, subtraction, estimation, division, bar graphs, and place value with large numbers (grades 3-6).